Date: Dec 6 2018, 8 a.m. - 4 p.m. In partnership with the Christmas Spirit Foundation and FedEx, MWR is excited to announce that Rock Island Arsenal has been chosen again this season as a distribution location for the Trees For Troops Program. Free live trees will once again be available to Military families of the Rock Island Arsenal community to include Guard and Reserve troops. Trees will be available for pick up on a first come, first served basis on Saturday, December 1st from 7 a.m. - 1 p.m. and again during the week (Monday - Friday) of December 3rd - 10th from 8 a.m. - 4 p.m. Please note, this year the distribution location will be at the Outdoor Recreation Office in bldg. 333 (next to the PX). 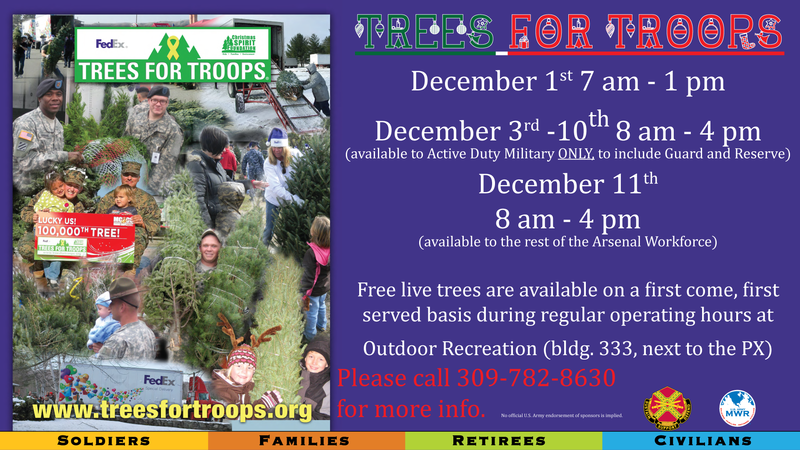 Beginning December 11th at 8 a.m. any remaining trees will be made available to rest of the Arsenal workforce. For more information please call Outdoor Rec. at 309-782-8630.